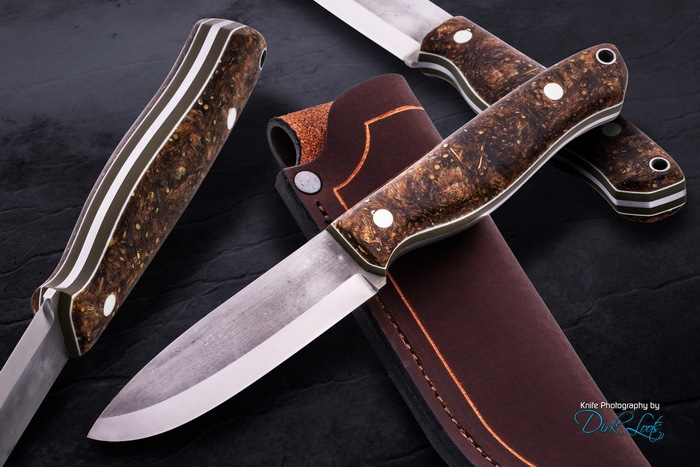 **** Chosen by Winner: Gary D.
This custom Dan Eastland Echo-5 fixed blade has a 4-inch blade of CPM-154 powder metallurgy high carbon stainless steel with forge scale finish on the flats. The knife handle is Stabilized Beer Hops over forest green G-10 with white G-10 liners and pins. It is 8.5 inches overall length. A leather sheath is included. Dan Eastland has worked with a blade of one type or another nearly all of his life. As a young boy, he followed his dad around the North Georgia woods clutching a new Barlow knife. He then spent time as a landscaper, an infantryman in the US Army, a carpenter, a furniture maker and all this time continued to be an avid outdoorsman. Dan used a wide variety of blades in these careers and applies this experience while designing and making his knives. It started in early 2002 when his first son was born. Dan was a full-time engineering student and was flipping houses in Atlanta when he had to make what he calls “the easiest but most important choice of his life.” His first son was born prematurely and after a week in the NICU was going to need constant care. With his wife having to travel with work, he withdrew from school, sold off all the properties he could, and became a stay-at-home dad. After a lifetime of working with his hands, he was slowly going crazy at home, so a friend and his wife conspired to get him into woodworking because he could do that in the basement at night and at nap times. After 10 years of woodworking he found himself standing in a blacksmith shop listening to a siren’s call. In the end, he worked a deal with the smith to teach him to make knives. One working bowie later he was addicted! When the smith moved his shop, Dan started running down Georgia Knife Makers Guild members and begged for help. Andy Roy of Fiddleback Forge invited him to the shop on a trial basis, and then could never get rid of him. Sanding, sweeping, what ever grunt work came along, nothing would run him off and he spent part of his time working in Andy’s shop to pay off his apprenticeship and the rest making knives. When Dan graduated from his apprenticeship he continued to work alongside Fiddleback Forge and Fletcher Knives, learning valuable lessons about quality knife making, customer service and running a small business. In 2013, Dan and his family relocated to Bucks County, PA due to a job change for his wife and the business has continued to expand and thrive. Following another relocation in 2015, he now runs his knife shop in Greenville, SC.